2. Who created the Lines? 3. Who were they created for? The world is full of mysterious places that have outlived the history of their construction. These are the pyramids, citadels, stone circles and statues that are much written about and are visited by hordes of tourists. Whether the period between catastrophes is 1,000 or 100,000 years, the site must be able to endure the extremes of weather and human interaction. I doubt that any structure built today is designed to last even one millennium, and there is a reason for that – they don’t need to. Yet, globally there are sites that have outlasted the very cultures that built them – often of such gigantic dimensions it would be difficult to recreate them today. Written languages are impossible to rely on, for they keep on changing. Not only are they affected by the latest fads and fashions, they can disappear altogether due to the assimilations and annihilations that are caused by cultural conflict. Just look at today’s near extinction of the Gaelic language, and how difficult it is to read Shakespeare’s “English” today. Languages will always change, whereas mathematics is a universal constant. A building four times as long as it is wide will always represent a ratio of 4:1, no matter how old it gets, or who studies it. Symbols are not perfect, but are still far more stable than words. Especially so if they resemble a constellation, an animal, a shape and so on. Hieroglyphs that use indirect representations are more difficult to decipher, yet most of them have eventually been decoded. This is the hardest aspect to determine. A good example is the Great Pyramid of Giza. We have always known of its antiquity, and in the last century we have become aware of the mathematics contained within its dimensions. But is it trying to tell us something? Theories abound and can become overwhelming. Therefore I have chosen to concentrate on a single, succinct idea, the cyclical global catastrophe, and apply it to not only the Giza complex, but every ancient site I study. 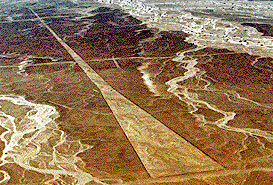 The Nazca lines conform to these three rules. They are at least 1500 years old, and are capable of lasting very much longer than that. That they embody symbols is obvious, and it is my belief that they describe the Great Flood. 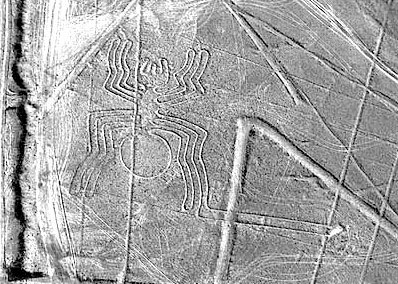 The Nazca lines and figures cover a total area of 520 square kilometers. 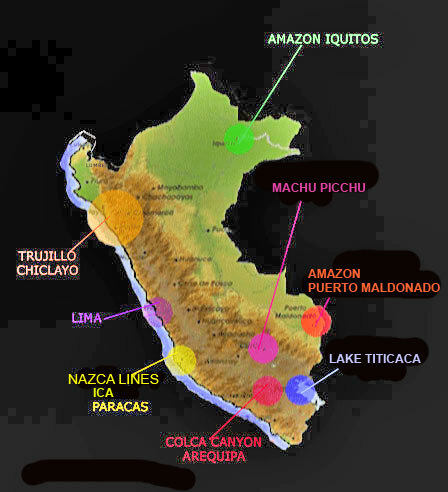 They are situated 400 kilometers south of Lima on the Pampa Colorada – a desolate plain between the Peruvian coast and the Andes Mountains (see map below). It is a rocky desert, rather than a sandy one. Its surface is covered in small stones that are dark red because they contain ferrous oxide. These have been cleared away to expose the lighter-coloured soil underneath, creating a multitude of lines. Dozens of stylized figures have also been etched onto the desert, creating the world’s largest piece of art. The figures have each been drawn using a singular continuous line, with the largest being some 285 meters long. There are 70 figures in total. In the most part they are creatures, such as a hummingbird, llama or dog – however a flower, loom and geometric shapes can also be seen. It has been mentioned by other researchers that many of the creatures represented are not native to the area. The most striking example of this is the 45 meter long Spider. It was identified as a member of the rare genus Ricinulei, which is only found in the most remote and inaccessible parts of the Amazon Jungle.These spiders are only 5-10 mm in length. One leg is noticeably longer – it is a protrusible tube, and at its tip is the spider’s reproductive organ, normally only visible with the aid of a microscope. This information appears to signify an advanced ancient culture at work, but fails when inspected more closely. 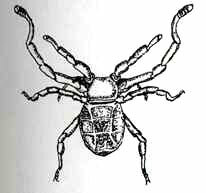 The only similarity between the spider figure and a Ricinulei is the extended leg. Otherwise the figure could be just a common local spider. Or the same as the depiction found at the Etowah Mounds (USA). Many of the figures on the plain have an extra leg or pathway attached to them – all we have here is a coincidental stylization. 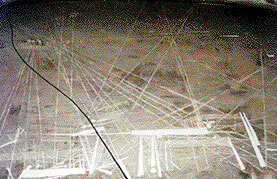 Overlaying the figures are 800 straight lines, some stretching far away, over hills and into the distance. The longest attain a length of eight kilometers, with one being an incredible 65 kilometers long! The lines were formed on top of the drawings and cut right through them. This suggests that they were created at a later date, unless of course this effect was done deliberately. Pilots first noticed them in the 1920s. In 1941 Dr Paul Kosok from the Long Island University was dispatched to survey them. Once there, he found the faint outline of a bird – the first animal figure to be discovered. He also realized that most of the lines fanned out from “radiating centers”, and decided that they described astronomical information. To survey Nazca properly would take many years, and he was too busy on other projects to do it himself. He found his replacement in a German woman who was translating an academic paper into Spanish for him. Maria Reiche had shifted to Peru in 1932 to work as a private teacher, but before long she was teaching languages and translating. Initially Reiche made short visits to the lines from her home in Lima. But as time went by, and she became more and more dedicated to solving the enigma, she moved closer to the lines – shifting from a Nazca hotel to a ranch that was within walking distance of the lines. After a decade on the ranch, she decided to live on-site, eventually dedicating her remaining 50 years to studying the patterns and working toward a solution. It was Reiche who discovered the other animal figures. None of these were observable from the air until she had carefully cleaned away the dust of centuries that obscured them. 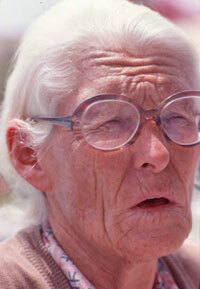 She agreed with Kosok that their meaning was derived from astronomy, and was unable to consider other possibilities. She privately published a book on the subject, but failed to conclusively prove her theories. Apart from the multitude of straight lines, Maria found triangles, “needle and thread” patterns, trapezoids, a labyrinth and spirals. There are more than a hundred spirals. Near the centre of one she found a stone engraved with a serpent design and a severed head – prompting her to believe that every spiral at Nazca represented a serpent. The image below is from a textile that was wrapped around a mummy found near Nazca. Her contribution was more than just highlighting the lines’ presence – she protected them as well. Human feet and vehicles can easily ruin the lines. Right up until her death at 95, Reiche almost single-handedly saved the lines from being ruined by trespassers, even known to chase them away in her wheelchair. Thanks to her efforts, which also kept governments and private enterprise at bay, the lines have now been declared a ”world cultural heritage site” by UNESCO.